Happy Friday! Today I'm so excited to be partnering with American Eagle and guest posting on their blog to launch their new Denim X Hi-Rise Shortie in 'light destroy!' American Eagle has always been a denim destination for my sister and I, starting way back in the day when I was a size 0 Long in high school and no one else carried that size. I was apprehensive to style a true short short, but I have to say that the denim of these is really soft and stretchy, so they hug your curves and lift everything in a really flattering way! I don’t know if there’s a more iconic summer clothing item than high-rise denim shorts though! They’re the epitome of classic summer cool, and can take you from the beach to a family BBQ and anywhere in between. 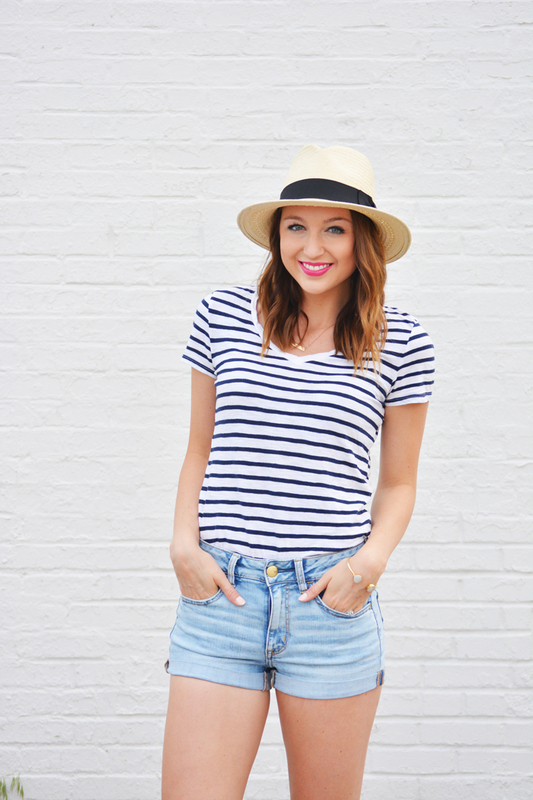 For this look I went back to some tried and true classics to create an easy go-to summer outfit. Sometimes I really over-analyze how to style denim shorts, but basics always end up being my best bet. Head on over to American Eagle's blog to read my guest post, and shop all of their adorable denim shorts, which are BOGO 50% Off right now (with site-wide free shipping)!